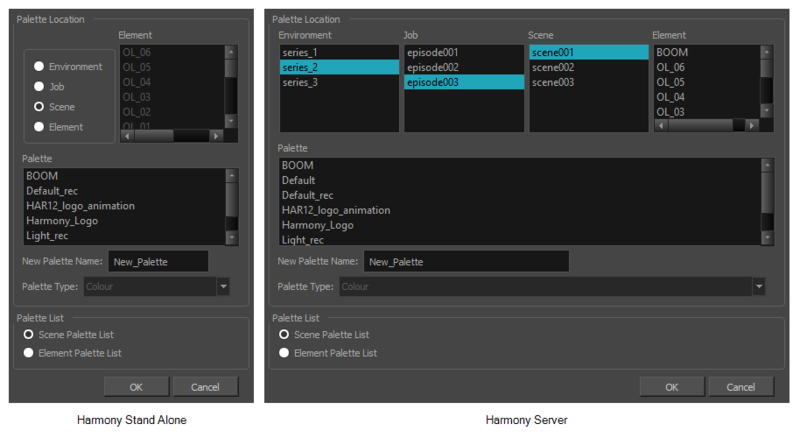 You can import an existing palette from your file system or network into your scene. This will create a copy of the palette file and add it to your palette list. From the Colour menu , select Palettes > Import. Right-click on the palette list and select Import. Browse for a palette file located (*.plt) on your hard drive. You can usually find a scene's palettes by browsing to the palette-library sub-folder of the scene's folder. The Import Palette dialog box appears. In the New Palette Name field, enter the name for the imported palette. The palette is copied to your project and added to your scene's palette list. If you want to add the palette to an element's palette list, select a drawing from the element for which you want to create a palette in the Timeline, Xsheet or Camera view. The Palette Browser dialog box appears. In the New Palette Name field, name the imported palette.